I am not sure how many of you visiting this page are familiar with the presence and importance of the EFS thing that we are going to talk about today! Actually, I often hear people requesting to offer a solution of a problem that makes them unable to make a call, send a message, access the internet or any connectivity related thing. Imagine a mobile phone without a network connection at all and you’ll then realize how horrible it is! If EFS is so important a thing, it must be preserved so that you might be able to use all connectivity features of your device. This thing is found in all mobile devices which have an IMEI (International Mobile Equipment Identity) number assigned to it but the location and directory where it is stored might differ. On Samsung Galaxy devices, the IMEI and other connectivity data are stored in this particular folder that I have been mentioned several times so far. Having read about the role of EFS on your Samsung Galaxy phone or tablet device, you must be a little more curious to know something more about it. EFS is a system directory that contains device specific essential information such as its IMEI, wireless device MAC address, baseband version, product code, system ID and NV data. In case the EFS directory is corrupted or lost, your phone or tablet is sure to lose its IMEI number and wireless and network connectivity. You might ask how and why does the EFS data on your device might be lost or get corrupted? The answer is pretty simple and the reason might be a daring activity on your part. 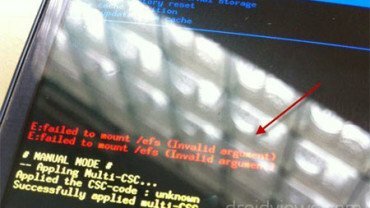 Sometimes flashing a custom Kernel (as reported by some users) and in most cases installing a custom ROM is responsible for the EFS data loss. In this way, the EFS or IMEI loss is deeply related with what you do after rooting your Samsung Galaxy device. 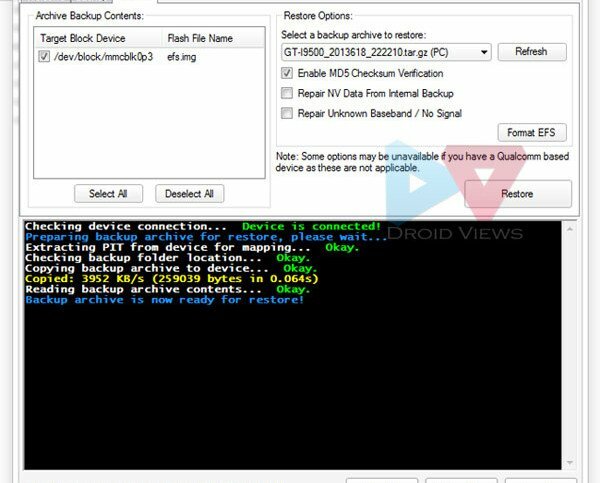 Keeping this thing in mind most of our ROM developers insert a script that automatically creates a backup of the EFS data on the external SD Card so that you might restore it back in case of loss or corruption. But it is certainly not wise to rely blindly on the wisdom of others. That is why, whenever we write installation tutorials for custom ROMs for Galaxy device, we warn users to backup EFS before indulging in any custom development activity. If you get this message on your phone’s screen, believe me, you have got into a serious problem. Of course, there are ways to restore EFS data, but they are either not available for all devices online or they do not work at all. Manually upgrading and downgrading firmware. Some users reported that they lost their IMEI during official OTA update. Installing a custom ROM or mod might mishandle system configuration, resulting in corrupt EFS. Any kind of bad flashing, the clash between new and old kernel systems can also lead to the EFS data corruption and IMEI loss. As the very title of this article says, we are going to tell about a very easy solution to back up the EFS on your Samsung Galaxy device. It is a simple but wonderful tool developed by XDA member LiquidPerfection that makes this job a plaything that can be done by anybody. The tool is called EFS Professional and it supports most Galaxy range of Android devices from Samsung. The latest version of the software also supports Samsung Galaxy S4 International (GT-I9500), Galaxy S4 LTE (GT-I9505), AT&T S4 (SGH-I747), Verizon Galaxy S4 (SCH-I545) and others. I have also tested it on Galaxy S3, S2, Note 2 and Note 10.1. Besides, EFS Professional works with other Galaxy phones and tablets too. A Samsung Galaxy Device with root access (custom recovery not needed). If you have not yet rooted your device, you can do it using our easy rooting tutorials. Install BusyBox app stable version 1.20.2 on your phone. Install the app on your phone open it. Tap on “BusyBox” version number and select BusyBox 1.20.2. Finally, then tap on “Install” and install it as “Smart Install”. Charge your device to ensure 60% battery level. So, do you think you are ready for action now? Make sure you have made all preparations detailed above. If yes, let’s get started now. Extract the “EFS_Professional.zip” on your desktop. Connect your Galaxy device to PC using a USB cable. Make sure USB Debugging is enabled. You will now see a new window. Once the device is detected, the lower part of the window will show the device status and info such as model number, firmware version, root, and BusyBox version, etc. Click on “Backup” tab and then click on “Device Filter” dropdown and select your phone model. If you do not see it listed, click on “Refresh” button and then select it. EFS Professional will now show the system partition where the EFS data of your device is located. Check the “Select All” box. Having backed up your EFS data, you might take a calm breath and feel a sense of security but it is also important to be familiar with the method how you can restore it back to your Samsung Galaxy device in case you lose it. Launch EFS Professional and click on “Restore” tab. Now click on the drop-down menu in “Restore options” part of the window and select the previously backed up file. You can also format the currently corrupted EFS directly. Your Samsung Galaxy device’s EFS/IMEI should now be restored back to its original location. Dia *#06# on your phone’s keypad to check it it has IMEI number or not. 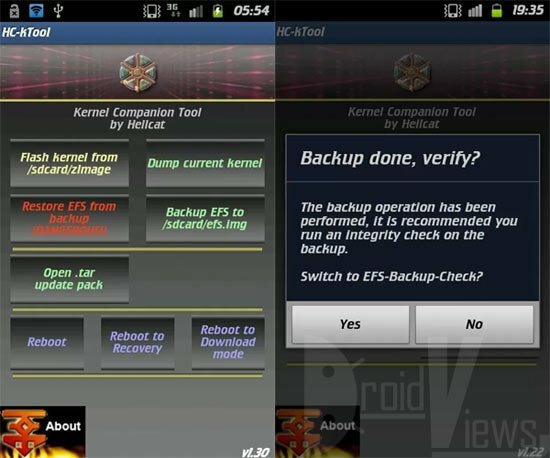 There is yet another handy utility for backing up the EFS and NV data on your Samsung Galaxy device. It is a free app and called kTool. Since it is a phone-based utility, it is easier to use. It supports almost all Samsung devices except the Qualcomm based LTE devices. Note: In case you notice that your phone’s lockscreen is not working properly after backing up the EFS, go to Advanced Settings in the kTool menu and enable “Alternate EFS Dump Method”. You might be already familiar with Aroma. 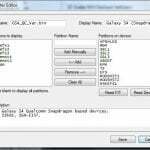 It is a custom recovery based installer that can install custom mods, ROMs and scripts. Unlike CWM or TWRP, Aroma Installer allows users choose from various options and provides customized installation. If you have a rooted phone with either of the above-mentioned recoveries installed on it, you can download the Aroma Installer from below and backup your phone’s EFS data and, if needed, restore it later. Copy the Aroma installer zip package to your phone. Turn off your phone and boot it into recovery mode. It can be done by holding down the Volume Up+Home+Power buttons at the same time for about 4-6 seconds. When you are in CWM or TWRP recovery mode, go to “install zip from sdcard> choose zip from sdcard” and then select the installer zip. TWRP users can simply tap on “Install “ button and select the file. Doing this will take you to Aroma Installer interface. Now all you have to do is to select the desired option and tap the Next button. Open the app and grant SuperUser permission when you are prompted to do so. Please note that all commands are case sensitive and even a minor mistake will hider the successful backup. Type the command line carefully. If everything goes fine, your EFS data will be backed up to the internal or external storage of your device. Do not forget to save the backed up data to your computer or cloud storage for safety and future use. You can find this file as “EFS.img” on your device. Open the app and go to dev/block directory and note down the exact path of EFS data files. 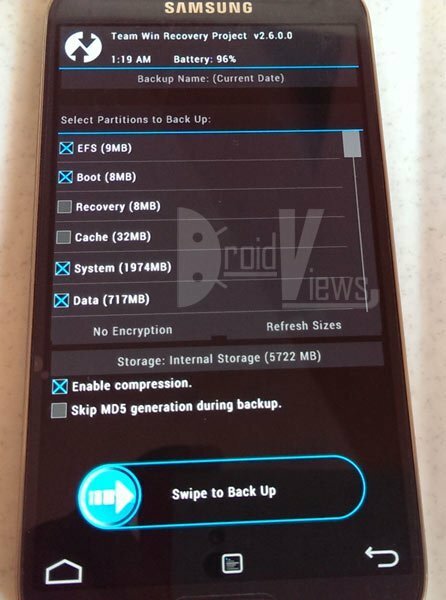 You can also backup EFS using custom recovery tools like TWRP and Philz Recovery. I do not think you need a guide to do that. Here is a screenshot of TWRP from my Galaxy S4. The option is found under Backup head. Though this post already has several solutions for backing up and restoring EFS/IMEI on Samsung Galaxy devices, we keep looking for even easier methods. 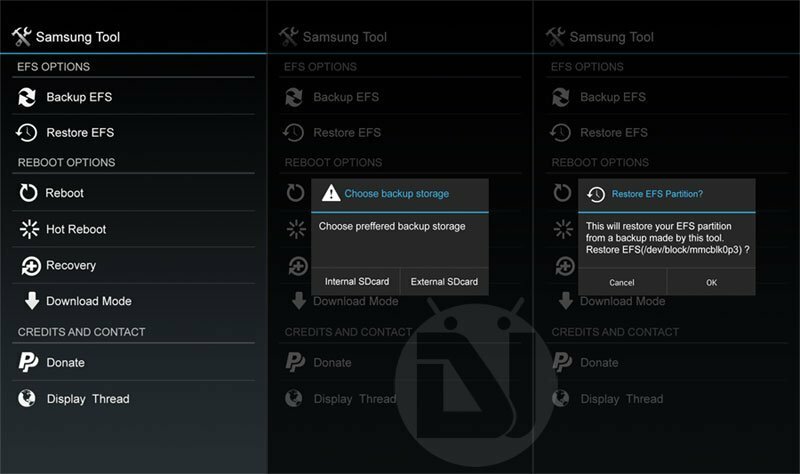 The Samsung Tool by ricky310711 from XDA forum is yet another smart tool that lets you backup your phone’s EFS in .img format to your phone’s internal or external storage. When required, you can restore the EFS using the same tool. The backed up EFS file is saved to the following location Storage/ extSDCard/ Samsung Tools. We tested the tool on Samsung Galaxy S4 and Note 3 and it worked fine. Besides, Samsung Tool also works as a reboot manager app. It lets you reboot your Samsung device into Download and Recovery modes without pressing the hardware keys. Apart from the tools discussed in this article, you can find many others that work with specific device models. You can try them too! With a hope that it proves helpful to the community, allow me to wind up here. If you have question or problem related to the topic, feel free to leave a comment below. Cheers! Hello,i did’t backup my phone efs file,does anyone got ?my phone model is Sm-N9208, thanks a lot. srcIndex” and then Operation failed. Ack! Have an S3 which seems to have acquired a few viruses notably the “eats your 4G credit in 2 days” bug despite not even using it and turning data mode off. Good Day! when i try to back up my imei using imei this notification arises UNABLE TO EXTRACT PIT FROM DEVICE.. whats seems to be the problem? I wish to thank you for this post. I’m new to rooting devices and installing custom ROMS. I followed your instructions then got an emergency calls only error on my device. After a lot of digging I decided to restore my EFS. Mind you there was a number in the IMIE number but it was not the same. Restoring it solved the problem ….. Thank You! what option is available to me to restore my efs if i didnt know about it until now? downgraded to 4.1.1 via m-odin on s3 i747 and lost all that plus service menu. please help me. i know what my imei is supposed to be. i used the first method…EFS Professional :)… i am really grateful to you…. This is a very helpful tutorial but I think I missed something, co’z did not resolve my phone GT-N7105 issues like NULL IMEI and Unknown baseband. I already backed my EFS then I’m trying to restore but the problem was not solve. Losing the EFS/IMEI is a common occurrence. We recommend a backup as precaution. Just back it up and save it to the external storage and PC both for future use if you lose it. Not sure if this issue has been disccussed before, but I cannot find it; if so, sorry. I have backed up the EFS file using your guidance above; all went well and the back up file GT-I9100_20140907_165911.tar.gz has been created. does not show it in the) this file is not visible. Would you be able to advise on that please? Still you can retrieve the EFS file even you don’t have a back-up, use Samsung Skies 3 then recovery just input the details. number is 08054746870 [email protected] presently in gurgaon. hi ,Rakesh i had a problem with my samsung s3,i wasn,t able to listen while making or recieving calls so i went for a fixture and the engineer told me he had to replace its sound IC and after he was done he said the phone has not been cured and its almost dead it has lost its imei so i feel he has mishandled its hardware .I am very tensed can you please help me out from where do i get it chaecked wether it can be repaired or any other solution don’t want to go to samsung they are rubbish,my number is 08054746870 [email protected] presently in gurgaon. No. Try one of the methods from above. Doesn’t work. I’ve followed this procedure, and everything goes smoothly, except for 1 very important part. There’s no file backed up. A folder called EFSProBackup is created (on the PC and the SD card), but neither of them have the EFS file in it (not even hidden file). There is any solution for LG G2 D802 (i do not have any mobile network or signal)? Can help anyone? Hi, I have a Samsung Galaxy Ace running CyanogenMod 7.2 (Official and Stable release) with CWM custom recovery(v5.0.2.6). I don’t have any problem with my phone, but just to be safe I’m backing up this EFS. But I haven’t found any option to backup EFS in the CWM. Can You actually do that? From the above methods I found using the Aroma Installer easy. I did all the 5 steps but after tapping next it’s saying ” installing apps please wait…” I waited for around 2 minutes and tapped the next button anyway and it returned to CWM and said installation completed. But after rebooting I cant find any efs file in the File manager. Then I tried Terminal Emulator method as in CM 7.2 there is a built-in Terminal Emulator and Superuser apps. I opened Emulator typed the above code but it said it doesn’t have access. So after watching some videos typed su and pressed enter. Then a popup came whether to Grant Superuser access to emulator, I pressed Yes. It showed “Terminal Emulator has been granted Superuser permissions”. I typed the above code and it said cannot read file (no such file). So I opened the file manager went to dev->block-> I found mmcblk0 not mmcblk0p3(like yours) so I replaced the code with mmcblk0, after pressing enter it says cannot write file(folder doesn’t exist). Now when I pressed enter, the cursor went to the next line, I assumed the file has been saved and closed the emulator. Then I opened file manager, I found the file efs.img but the file size is 225mb! In one of the photos in this post(Backup using CWM/TWRP) the EFS size is only 9 mb! Also what is the difference between sdcard and External sd? Can u provid the link of busybox 1.20.2 ver. Whenever i to run the tool it says somethinkg like “failed to start ADB server. application will now close”. I have a windows 8.1 64-bit runing on my pc. Also, does it support my Galaxy Nexus. Allow on-screen USB debugging pop up on phone when prompted. same problem with Aamir, please help! i have already allow USB debugging on developer options. any method to backup imei without root the phone? I use SGS4.So after upgrating firmware I lost EFS data and any mobile connection. IMEI request gives a result “null/null”. I tryed to use EFS Professional but after USB-connection was done the program shows only this message: ‘Checking application environment… Okay. Initializing ADB server…'(see image below) and I can’t do any other actions with it. What does it mean? I need your help. Thanks. @Preetraj Sidhu Formatting does not wipe IMEI. @Rakesh ok bro…m afraid tht by formatting my phne’s imei will again become 0049xxx…….???? wat to do ? and how to reboot after format ??????? Hi Brad, seems you got TWRP finally. 🙂 As for the EFS backup, you can use any of the methods but obviously the TWRP way is pretty easier. after having flashed the 4.3 version found on Sammobile. SN and IMEI are correct. now what i do ? Try rebooting your phone or install a different firmware. hello….M USING i9300….&.i flashed my firmware using odin….and NW it says unregistered on network and imei changed to 0049xxxxxxx……….i tried lot of methods like azira patch…..etc…bt nobody work….nw my verson is 4.2.2…..and my phone is rooted……..nw what to do to restore my imei no. and make my NETWORK registered ??????? hi bro….nw i restored my imei back and everything is fine nw…..bt m unable to send text msgs bcoz message centre no. is nt set….when m put tht no. in msg centre ….it said unable to save msg centre no……..nw wt to do ??? hi bro….m afraid tht by wiping / reset cache my phne’s imei will again become 0049xxx…….???? becoz i restore my imei from shop…..
nw wat to do ? may i take risk of factory reset or not ? Data/factory reset does not touch EFS partition. ok……can i reset now ???? r u sure bro… that nothing happen to my imei no. ??? i do…..bt it doesnt solve my prob…..it says unable to save message centre no. Try this: remove your SIM, then format the device, put the SIM back and reboot the phone. My phone doesnt pass the bootloader. I just have the “Download Mode” or “adb sildeload” and my PC to solve this problem, how to I proceed? reinstalled my phone using kies no luck but phone works but no signal, Oh forgot the mention my phone is GT-I9300 its not the Qualcomm processor its the Exynos 4412 Quad. How can i get my IMEI number back i have no back ups i have looked on the phone nothing. Please any one help 🙁 . I have tried NV-items reader / writer but id does not detect my phone. Did you recently downgrade or upgrade firmware? Hi Rakesh, even my phone is i9300 Exynos 4412 Quad so the NV item reader did not work. So is there other way to repair my imei which turned into a generic number(000049XXXXX)??? How did you lose the IMEI? I downloaded the latest Android 4.3 flashed it through Odin and it got stuck installing i then pulled the cable and reinstalled , it booted fine after that but i had no signal. I then read about it saying my IMEI number is wrong. Flashed my i9300 international version phone with Cyanogenmod 10 and lost my network. Went back to stock rom and rooted it as I read it somewhere on internet that it would solve my no network issue. My imei number is corrupted and shows up as 0049***(generic number) but my serial number seems to be OK. I was on Android 4.2.2 official Samsung firmware then i installed paranoid Android with android 4.3 i then reinstalled the official Samsung 4.3 when it came out after that the problem started . Without backup, you will not be able to restore the EFS. There are shops with IMEI Repair tool. Contact them to fix it. That’s a very old tutorial of GB and ICS days and it would not work on new firmwares. Yes it didn’t help. So still looking out for someone to guide me get my original default EFS folder back. I am presently on 4.0.4 Android version, so is there any need to upgrade my firmware or Android version?.. Thanks for your time, Will follow your advice.. So make a new tutorial man…..
using this need to use any box like stp box? No. More methods added, try them too. Hi Rakesh, Need help… Recently flashed my i9300 international version phone with Cyanogenmod 10 and lost my network. Went back to stock rom and rooted it as I read it somewhere on internet that it would solve my no network issue. My imei number is corrupted and shows up as 0049***(generic number) but my serial number seems to be OK. So I am not sure what do I do to get this thing sorted out.My baseband version is I9300DDLEA and Android version is 4.0.4. Serial number starts from RSXXXXXXX. I did not back up my efs folder before flashing custom rom. Can you please help me get back my imei number and network? Can you see a folder or file on your internal/external storage with “efs” in its name? Thanks for replying Rakesh, Yes I can and I also have contents in it like nv_data.bak etc, my mistake was that I did not back up my efs before flashing custom rom and this probably corrupted my imei but right now I have no idea as to how to recover the original imei. Well, that won’t help as that directory contains the corrupted EFS data. 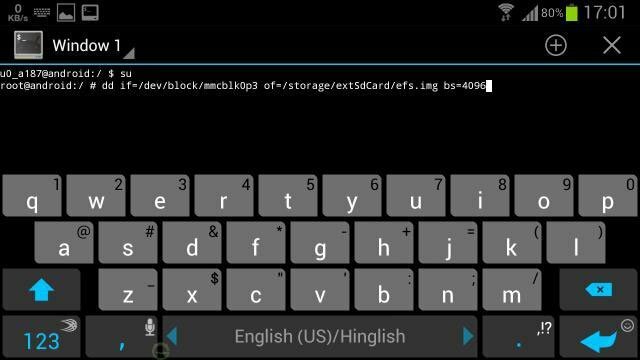 What I meant was- can you see an EFS file on the sd card of your phone? It does not support low end devices. Use KTool or Galaxy Toolbox. Recently I root my Note 8.0 GT-N5100 by CF-Auto Root. Then backup EFS by EFS Pro. Later I used Triangle Away to 0 the counter. However after that, in “About Device”, my “Baseband version” is unknown, so as my “IMEI”. But my Wi-Fi Mac address is there. So I tried to restore my EFS backup, and the EFS Pro says success, but the problem still the same. When I click the “Device Info” in the EFS Pro, it states “Unknown” for the Product Code, Hardware Version, and Baseband Version. Please help! Thank you. Did you use the paid version of Triangle Away or got it from some third-party website? EFS is mainly associated with IMEI and network connectivity issues, it’s the modem used in the device that is responsible for WiFi connectivity. One of our users solved a similar issue and you can find his solution below. If that does not help, I would recommend you to flash stock firmware on your device and check if product code and baseband are fixed. If they do, root it again and then try restoring the EFS. even without rooting!! I’m begining to doubt whether it is related to mounting the “EFS”, as my EFS data is intact. is not enough for GBs :). I also found that my proximity sensor and vibration also not working. From XDA I learned that Proximity stores a calibration file in EFS folder, so I need to compare my EFS folder with a working one to see that it don’t miss any files. Rakesh, will it be possible for you to help me here, I need a compressed .zip or a .tar file from a working Galaxy Note 8.0 GT-N5100 (this is the 3G version, not Wifi). and remember open the .tar file in 7-Zip and delete “nv_data.bak” and “nv_data.bin” files, since these two files contain the IMEI of your device, using them on another phone is illegal, which I’m not going to do, but it’s safe :). A help is very much appreciated. Thank you. Hey, does twrp back up the EFS as well? Am I able to restore it from there after wiping the phone for installing a ROM? Is it possible to back everything up without the need of a computer? You can also backup EFS using Backup option in TWRP. I would also recommend you to keep a copy pf EFS on computer too. You need to restore EFS only if you lose your phone’s IMEI. Yes, you can backup everything without computer. Read the root apps article. I gave you the link yesterday. I have successfully installed Carbon ROM along with all the back up files. Thanks for all your help! Thanks. Just one problem, how would I install Google apps? There is nothing here. Trying to install the Carbon 4.3 rom onto my GT-I9505 LTE and it appears to wipe the EFS partition. Tried your process to back this up using EFS professional – seems to work – backs up my 4.2.2 EFS data OK. However the moment I flash and then go and try and restore – EFS Professionial won’t pick up my phone, the PC recognises that the phone is connected but not the software. Any suggestions? Try to match the visible IMEI with your phone’s actual IMEI. Does it match? Hmm, then how did you conclude that your phone has EFS problem? Keep the backup as precaution for future. I think it is a modem issue. Try a TouchWiz based rom to make sure if the problem is really real. Hi! Thanks! But in my case, my Galaxy I9300 doesn’t inicialize anymore. It is looping, and when I inicialize by the ‘CWM’ it shows the error with the EFS. Is there some option for me? Have you installed some custom ROM? Yes, I tried many ROMs including custom. Try Galaxy Toolbox for that. Sorry to bother again but Can I use the omega firmware even if my phone is ubuamde firmwre? The Cellphone Hardware model. For some reason the omega firmware doesn’t match my phone hardware. I even flashed back the modem restore and the phone signal never came up. I have a simcard locked Samsung i9500. Is there a way to flash a omega rom without loosing imei? I tried this software but I didnt format the efs option. Is that a must? Root the device and install Omega ROM. No harm will be done. I did it but never restored the imei data on the cellphone so I had to flash the stock rom back. My question is if is necessary to use the format efs option on the efs proffesional? when the imei doesnt restore? 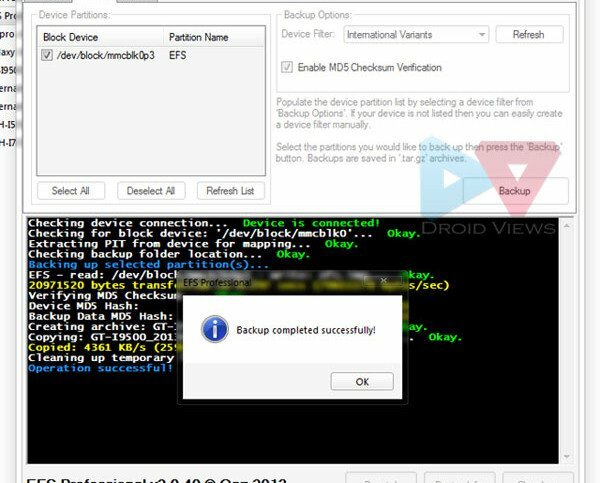 thanx..i just solved it…we just have to copy that file (EFS) to phone aswell…then the backup option appear..
Omega automatically backups EFS data. How did you do bro ????? Did you backed up the IMEI or EFS data in the past? If not, I am afraid you will have to use the Octopus tool fix the problem or find a guy who has this tool. BusyBox shall be installed in advanced mode, which install much more packages. EFS Pro fails to create archive. All was going well until the creation of the archive. Device was recognized correctly, efs.img created and located on sdcard, pit file located on PC. After starting efs professional, it says that it failed to start adb server…what does that mean? I see on busybox that there is a later version, 1.21.0..should I still install the 1.20.2? Yes, the older version is more stable. Thanks. A problem I’m having now is that it says I have to authorize with PC or something, and then it hangs on “checking device, please wait…”, though it seems to identify everything. I did some research and it seems I have to update my sdk? Having trouble doing that. Any advice? When it says checking device, you should see a popup screen on phone’s screen asking for authorization. Accept it from there are it should be okay. Thank you. Last question. In your article it says sch-1535 is the verizon s4, but the verizon galaxy s4 is sch-1545. There is no sch-1545 in the device filter on EFS pro. There is sch-1535, however. Do I just use 1535? Sorry for all the questions. I’m new to all this and am paranoid about messing up. The post has been updated too. I reinstalled efs pro using the link provided in your comment. Sch 1545 still isn’t listed. I don’t know what the deal is and what I would be doing wrong. If I can’t use this, should I just copy and paste the efs folder? Okay, can you see any S4 model with Snapdragon chip? If yes, select that. That worked. I used the one for I9505. This is a nice, easy to follow IMEI backup guide! Clear the ols efs file first and then restore. 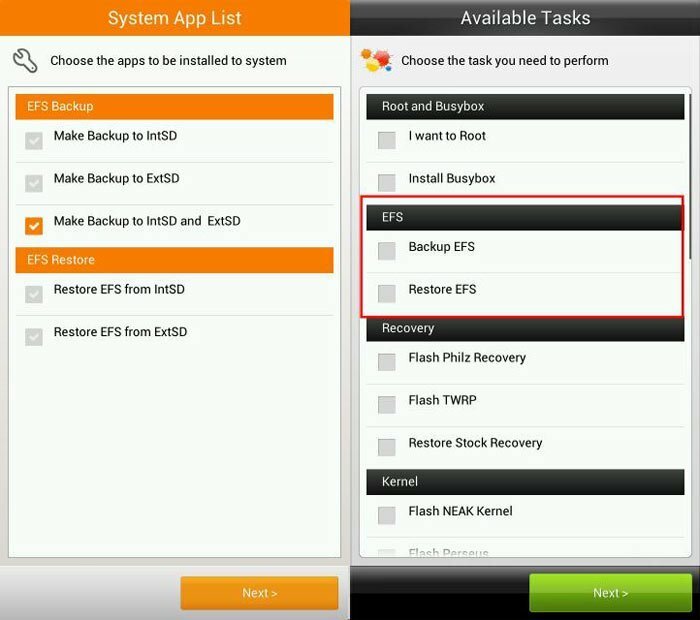 Use the Format EFS option under Restore Options in EFS Pro and then restore the backed up EFS. If you are not having network signal, check the 3rd box too and restore it. But format the old EFS first. one more thing apart from making a back up i had also copied the efs folder in one of my separate folder which is still present.what to do next? Format the EFS partition that contains fake IMEI, check Repair NV data option and try restoring again. i’ve a SGS3 GTI9300 and will i not require root access to use EFS PRO? Yes, root is required. Also do not forget to install the BusyBox app as directed in the guide before trying. 2) is format efs required and repair nv from internal and check sum need to be checked before format or along with it? Yes, EFS partition lies on internal system and therefore EFS Pro or any other app must have access to that partition of device to be able to modify it. Busybox provides more freedom to the application so it is necessary too. You can use the previously backed up EFS/NV data while restoring. Formatting has nothing to do options like md5 checksum or repair nv. They should be checked while restoring. 1)Took a backup of EFS via philz touch recovery. 2)Made a new folder named efs in sdcard ie sdcard/efs and put the extracted contents of previously backed up .tar file in it.the extracted contents were efs.img. 3)deleted the contents of efs folder in the root explorer. 4)connected via EFS PRO and used format EFS without checking rapair nv data from internal backup and repair unknown baseband. 5) after format efs was successful i chose the file for restoration which in the drop down menu gave only the previously backed up efs file(via EFS PRO only in .tar format) in device(earlier i had tried restoring through the file saved in my pc but no results) and then hit start and viola it was done phone rebooted and i got imeri back and started working.